Shale Gas: Exploration and Environmental and Economic Impacts explores the shale gas exploration and production activities that are increasing globally, also presenting a basic understanding on the geological, geochemical, and geophysical aspects. The book is a key reference that is useful for researchers, the oil and gas industry, and policymakers in gas producing and prospective countries. 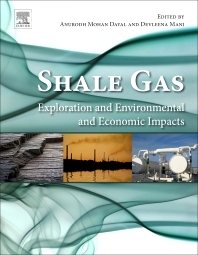 Users will find chapters on hydraulic fracturing and shale gas drilling, as well as the environmental and economic impacts of these activities. Further chapters include case studies on the shale gas revolution in the United States and other producing countries around the world. Dr. Dayal received his M.Sc. and Ph.D. in Geology from Pune University. He researches the exploration of hydrocarbon in Indian sedimentary basins using surface geochemical prospecting techniques. During his tenure he worked with various oil companies in India and abroad in their exploration block. Dr. Dayal has published more than 100 research papers in top research journals, written more than 22 technical reports for various oil companies, and has contributed chapters to five books. He retired as principal scientist in January 2012 and CSIR awarded him the position of an Emeritus Scientist post for a period of three years to continue his work on shale gas. Dr. Mani is an organic geochemist at CSIR-NGRI, Hyderabad. She studies isotopic and biomarker characteristics of sedimentary organic matter, paleo and depositional environment and thermal history of source rocks, thermal degradation and kinetics of kerogen cracking. She also works on geochemical evaluation of hydrocarbon and shale systems and development and application of analytical methods using stable isotope and organic mass spectrometry. Dr. Mani has authored 35 peer reviewed papers in leading journals and contributed to the more than 25 projects on geochemical evaluation of hydrocarbon and shale systems for various oil and gas industries in India.